Police searching for a missing man in Aberdeenshire are to revisit the area where he was last seen a week ago. 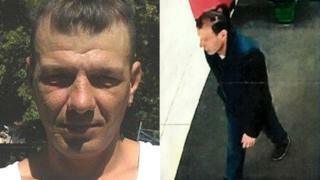 Marian Pavel, 45, was last seen in Huntly last Wednesday near the Dean's shortbread factory on Steven Road. Officers will be in the area to speak to people between 18:30 GMT and 20:30 in the hope of jogging memories. The Romanian national is about 6ft 2in tall, with brown hair which is shaved at the sides and usually pulled back in a ponytail. When last seen Mr Pavel was wearing a dark blue jumper, a grey woolly hat, blue jeans and black shoes. A CCTV image was captured at the town's Asda at about 18:30 last Wednesday, an hour before he was last seen. Insp Matt Smith said: "It is hoped by revisiting the area where Marian was last seen we will be able to speak to people who were in the area last week and may have seen him." He asked anyone with information to contact police.